Chonburi put the final touches on plans for the local version of December’s Bike for Dad cycling event to honor HM the King on his birthday. Gov. Khomsan Ekachai met with provincial agencies and private groups to review the final 29-kilometer route for the Dec. 11 trek that runs from 3 p.m. to 6:30 p.m. In addition to the ride, Chonburi will hold an exhibition to honor His Majesty from Dec. 11-13 at Aow Udom Community Hall in Sriracha. The exhibit will illustrate the King’s history and his visits to Chonburi. Gov. 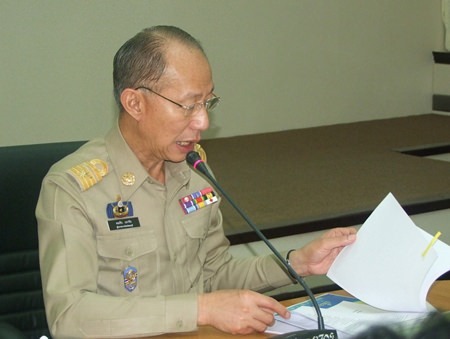 Khomsan Ekachai met with provincial agencies and private groups to review the final 29-kilometer route for Chonburi’s version of December’s Bike for Dad cycling event to honor HM the King on his birthday. Chonburi’s Bike for Dad route begins at the provincial hall and passes eight landmarks, including the King Rama V monument, Hor Pra Buddasinghing, Suan Tan Temple, Meung Mai Temple, Angsila Temple, Tam Nak Maharaj, Komutrattanaram Temple, and Nah Ja Sa Tai Jui Temple. After leaving the start line, cyclists will ride down Partsapetra Road, turning right onto Wachirapakarn Road and right again at the Chonrajsadornamrung School intersection. The route continues past Angsila, around the S2 Hotel on Bangsaen 1 Road with a rest stop at the Laem Tan zone. Riders then reverse course and head back along the same route. Registration can be done online at BikeForDad2015.com.